"Dear Emperor, I would like to ask you, why do you choose light over dark? Just calm yourself. I train hard under the power of Jedi Master Yoda (made from TIGER electronics). I am a Jedi Knight. I will turn you to the light side of the force if it is the last thing I (or you) do!" Emperor Palpatine: your pathetic attempt to turn me to the light side of the Force might indeed very well be the last thing you'll do... [the Emperor has an evil grin on his face] .... but I will never turn to the Light Side, my young friend. The Dark Side of the Force is much more powerful, easier to master and allows me to do cool lighting stuff with my hands. Okay, the only downside of the Dark Side is that it's pretty bad for your teeth... but since I destroyed my dentist years ago, that's a minor concern. Forget about Yoda! Join me instead! siths, and your guards. I hope in episode 2 or 3 you'll win! Your Servant, Joshua"
Emperor Palpatine: that's the spirit, Joshua! I will most certainly win in Episode 2 and 3. The Dark Side of the Force will get stronger and stronger! "To the emperor. I don't get why every one doesn't like you. You offered Luke the Galaxy on a plate and he tried to kill you! That was very nice of you. I personally wood say tank you. 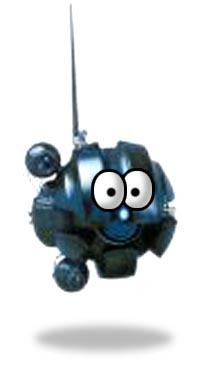 So every body give the sith a brake they are Relay quite nice." Emperor Palpatine: well, Jedi are in general very ungrateful, irritating people. Sith Lords are much better company, trust me! Jedi always make life so hard for us, honest Dark Side followers. I like your attitude and I agree: we Sith are really quite nice! generations (Shmi, Anakin, Luke, The Solo kids). He's pretty old." Emperor Palpatine: Hmmm... you are asking about some very important Dark Side secrets... hmmm... let me say this: I am indeed very old. The Dark Side of the Force feeds me with a lot of energy to live a long, long time. "Dear emporer, you are stupid!!!!!!!!!!!! this one peace of information is true: the Jedis will destroy you. I have already sent an E-mail saying I am glad to be obi's partner and that we will destroy all siths and dark jedi's. 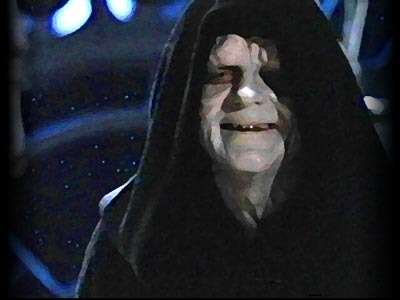 your enemy Christopher"
Emperor Palpatine: Good! Gooood! Let your hatred for me flow through you. FEEL how much power your anger gives you. Go on, hate me! That's an excellent way of getting to know the Dark Side of the Force. "Palpatine, why did you give in to the dark side?" Emperor Palpatine: That's an easy one to answer. Once I discovered the Dark Side of the Force, I realized that it would give me unlimited power and control over other people. It made me become what I am now: the Emperor of the Galaxy! If I would have followed the light side of the Force, like Obi-Wan, I'd be living on a dusty sandplanet littered with Bantha Poodoo, surrounded by stupid Tusken Raiders. No thanks! I prefer the Dark Side! Proby: Emperor Palpatine, thank you so much for your time! It was great to have you on the show! Emperor Palpatine: I never miss an opportunity to make some publicity for the Dark Side of the Force. And remember kids: may the Dark Side be with you.. always!